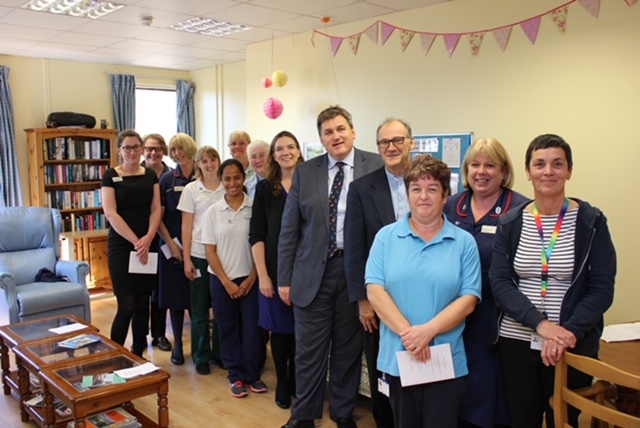 KIT Malthouse, MP for North West Hampshire, paid tribute to the staff of Andover War Memorial Hospital during a special event held to mark St Luke’s Day. “I’d like to say a big thank you to all of you,” Mr Malthouse told staff at the event. “The thing that makes a critical difference in healthcare is the staff and it strikes me that working in healthcare is not just a job – it’s a vocation. St Luke, who is reported to have been a doctor, is the patron saint of physicians. His feast day is 18 October and it is traditional for this day to be used to celebrate the efforts of all those working in healthcare. The chaplaincy team at Hampshire Hospitals NHS Foundation Trust, which runs Andover hospital, as well as Basingstoke and North Hampshire Hospital and Royal Hampshire County Hospital, in Winchester, led short services each of the hospitals to mark St Luke’s Day. Mr Malthouse was joined at Andover hospital by Alex Whitfield, chief executive of the Trust. She said: “Our staff are caring and innovative people, who show amazing passion and compassion for our patients. I’m delighted to be able to call all of you my colleagues.“We are part of a long history of people taking care of others in their times of need.